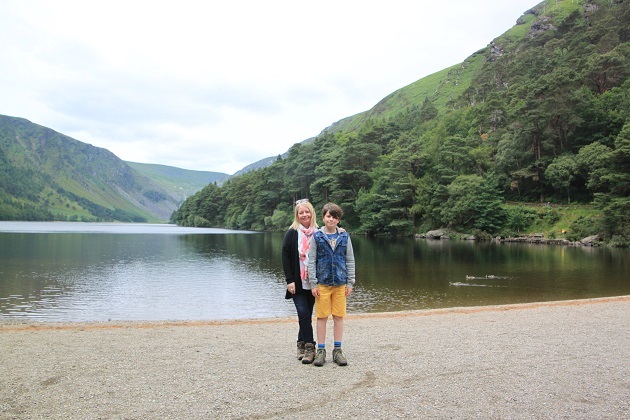 Our last day in Wicklow, we got up early and took the half hour drive from our hotel to Glendalough. 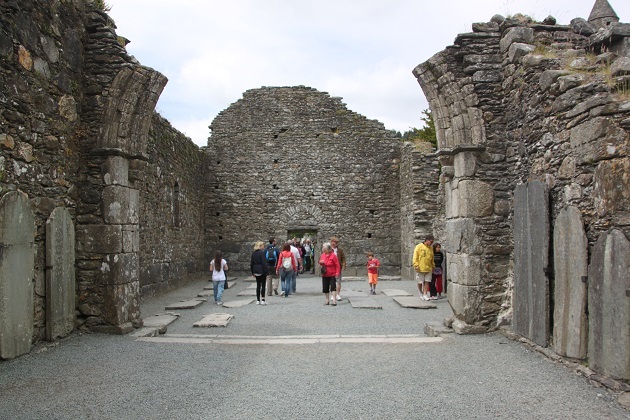 Eagerly anticipated by all of us, this one time lonely place has become one of Ireland’s most popular monastic sites and we’d read and heard so much about it. It was the retreat of St Kevin and is one of the most important early Christian sites. Impressive enough to start with but then there’s the setting and the scenery – they are simply stunning. 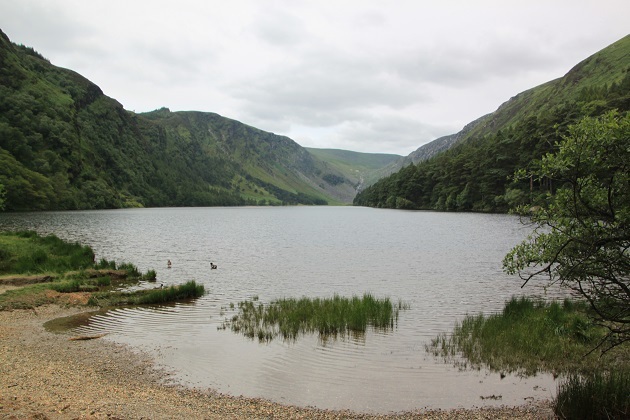 Glendalough literally means “Valley of the Two Lakes” and is in a wooded valley between two tranquil lakes – breath-taking from first glance. We struggled a bit to find the place and then the car park, signs were a bit thin on the ground but we persevered. A lady at our hotel recommended parking at the upper lake, we took this advice and it worked well. The lower lake car park was packed, people everywhere milling around but we had the opposite experience. Just a few cars, hardly any people and the upper lake was an oasis of tranquility and calm. We paid a small fee to park here (parking at the lower lake was free) but it was most definitely worth it. 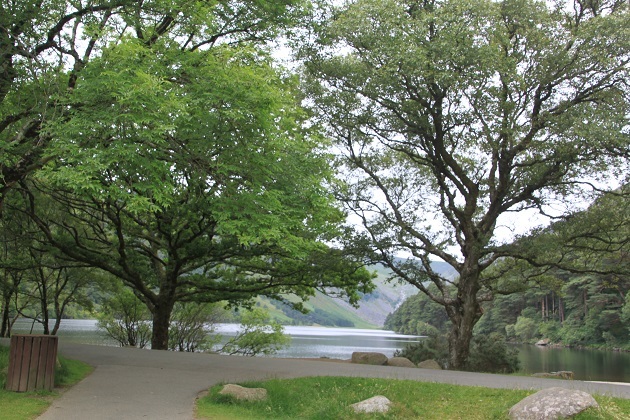 It’s just a very short walk from the car park to the upper lake. We had it all to ourselves, apart from a duck family with some cute ducklings – Son was, needless to say, most taken with them. We were most taken with the view – this place is special, so calm and so peaceful I could have sat here and taken in those views all day. That wasn’t to be – our energetic boy was happy to mooch around for a little while but was soon keen to get going. We strolled along the lake until we came to a little house. Inside there were no end of maps, guided trails and a host of stuffed animals. All had died of natural causes or in an accident, none were killed for stuffing (phew) but it was interesting to see up close, even if they were no longer with us, a sample of the local wildlife. Son was also very intrigued by the Bat Cam. A colony of bats live in the attic, they have infra-red cameras up there and show live feeds on a screen downstairs, not much happening when we were there – very sleepy bats – but it was interesting nonetheless. 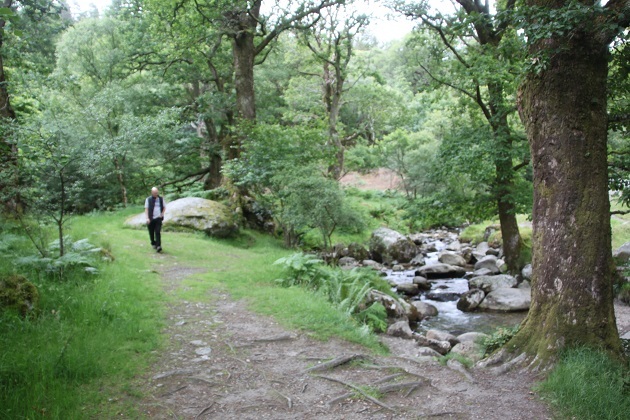 We carried on through some gorgeous woodland along a mainly flat and well maintained path to the lower lake. It took just about twenty minutes, no complaints from Son about the walk so success all round. There was plenty of wide open space for him to run free, a babbling brook was a highlight for me. There are so many walks and trails around this whole area, some take you further through the woods, some take you beyond the lake and we saw some challenging hikes which take up most of the day. I would have liked to try one of these out, time constraints though meant we just walked to the lower lake and those incredible ruins. Getting closer to the lower lake we saw the famous tower and church in the distance. Closer still we found we no longer had the place to ourselves, crowds of people just about everywhere – what a contrast. We made our way to the visitor centre fully intending to check out their exhibition and audio visual presentation about the site and its history. We queued up at the desk, money at the ready but the lady there put us off. She suggested we should take a free leaflet and go see the ruins first. Then (her words) if we “really wanted to” we could come back and see the film later. Seemed like they sell this all a little short really, this was their approach with other visitors in the line behind us but I have to say, it did work out for us and we never did go back to see that film. We made our way to the monastic site, very close to the Visitor Centre, past the huge numbers of tour buses, people gathering for guided tours and students generally milling around. Bustling and busy and just as far from the peace and serenity of the upper lake as you could get. 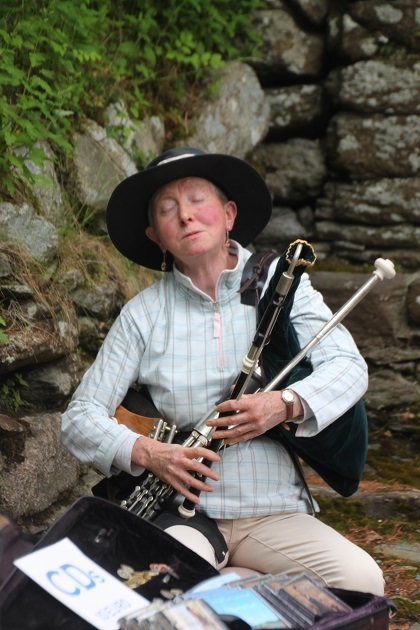 At the entrance to the ruins was a lady playing some sort of traditional Irish instrument and singing. Husband and I lingered a while and listened. Son had spied out a host of ice-cream vans along the road and decided a giant chocolate cone was required before exploring any further. Despite the large numbers of people this still feels like a special place with a special atmosphere. 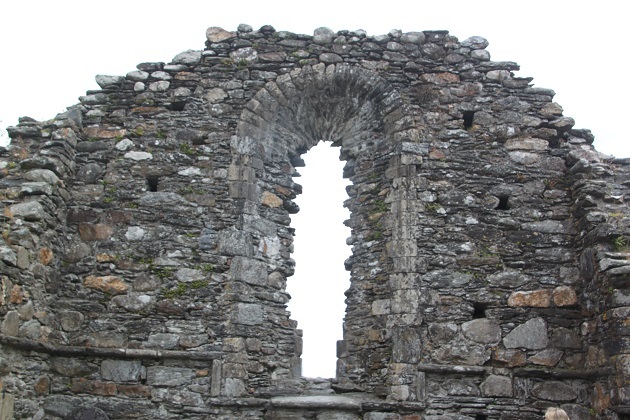 It was founded by St Kevin in the 6th century and the “Monastic City” developed from that. 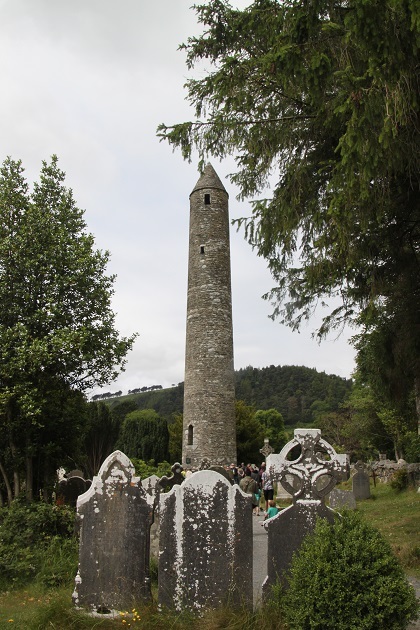 There are a number of monastic remains to see, the Round Tower was our favourite. It stands 30 metres high, Son was most intrigued by where the door was. We discovered it was an opening quite high up in the tower. Those monks had the nifty idea that they would use a ladder to get through the door then this was hauled in and the door slammed – they weren’t bothered by too many intruders. 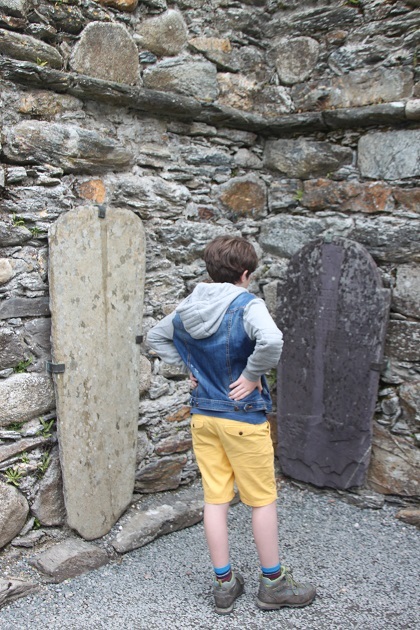 We had a look at St Kevin’s Church, commonly known as St Kevin’s Kitchen and the cemetery. Afterwards we took the boardwalk back to the upper lake. A wonderful natural setting and a slightly different perspective on the lake as we viewed it from the other side. We spent just over four hours here – history and nature at its finest. 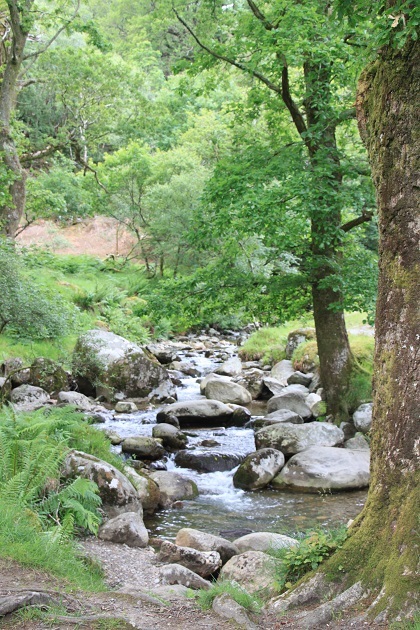 It is really lush, green and lovely – plenty of rain I’m sure makes for all of that but it is beautiful. Great post! Indeed if you can tune out the crowds, it is an amazing place. Thank you! We loved the seclusion of the upper lake and the crowds were a bit manic by the ruins but still a wonderful place. It is lovely – green, calm and serene! Glendalough is one of the most beautiful places I’ve visited in Ireland so far! As you said, it has something magical!! It’s a pity you didn’t do one of the long hikes, as the views of the lakes from the top of the mountains are incredible. Did you visit it during early Autumn?? It’s easy to hear the deer roaring from both sides of the upper lake during the rutting season!! We visited late summer but I would love to go back and see the deer in the rutting season – sounds amazing! Thank you for the tip – I will definitely make note. Next time we’ll also do one of the longer hikes! 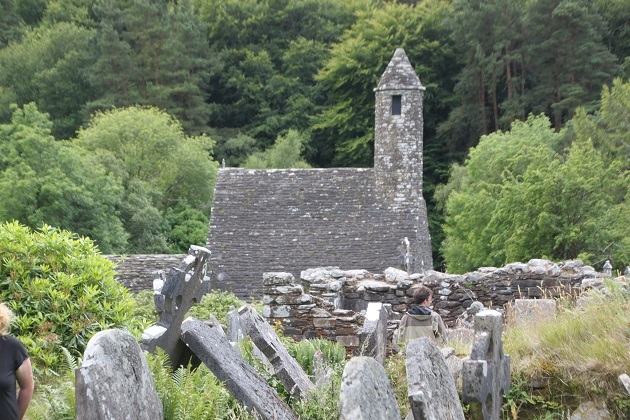 Glendalough looks idyllic Joy with the lakes, hiking trails and monastery. I like the idea of the live bat webcam even if they weren’t doing much! They were very sleepy bats but then it was the middle of the day. Intriguing though, we couldn’t stop watching even though they were just sleeping!! The whole place is beautiful, I would definitely go back and try out some of the hikes. What a wonderful spot. 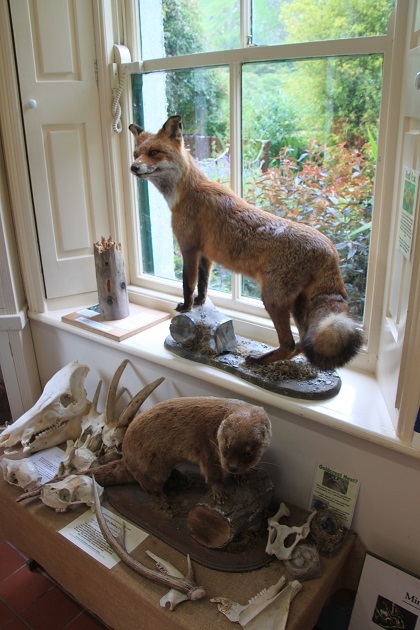 This is the type of place we love to visit – a nice mixture of nature and history. Something for everyone here Laura for sure, it is a beautiful spot, we loved checking out the ruins but then all that wide open space for a feral boy to use up energy is just perfect! Joy, what a beautiful spot to visit in Ireland, wish that we would have been able to see on our trip last year. Your photos capture its beauty! It really is a lovely place Pam with a very special atmosphere – despite all the other tourists!! 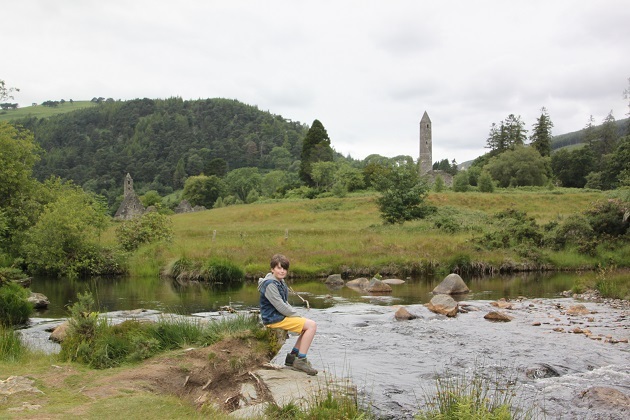 Glendalough is a gorgeous area, I remember visiting on a one-day bus tour to Wicklow from Dublin and we stopped off there for a little while; I’d love to go back and have the time to explore further. The bat-cam sounds brilliant! We had about 4 hours there but really you could spend a day – would have loved to do one of the big hikes, they sounded amazing with wonderful views…. maybe another time!! The bat cam was great, they weren’t doing too much but just to see them up close sleeping was so interesting. It is a gravestone Andrew – a very old one at that. He has a grim obsession of reading gravestones, didn’t get too far with this one though, it was illegible. What a beautiful, peaceful looking area. Is it really just like that? The upper lake is serene, peaceful and so calm George. The crowds at the lower lake and the ruins are something else!! One of my favorite places int he world…there is something special about that place. Completely agree, despite all the crowds and visitors it has a serene and lovely atmosphere. 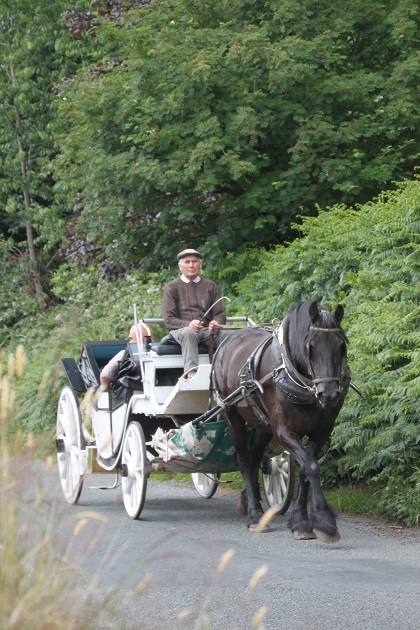 On my tour around Ireland Wicklow was on the list. Your photos show we almost stood in my of the same places and my photos are similar to yours. Thanks for taking me back on my wonderful tour of Ireland. Lovely post. Wow – what a coincidence!! 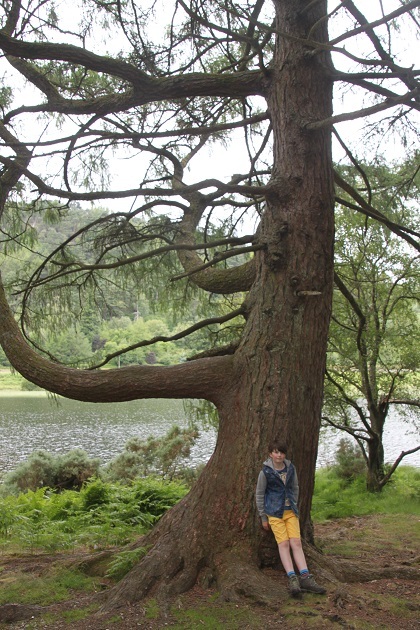 Glad you loved Wicklow and Ireland – hope the weather was ok!!! Beyond great. Went this past May had warmer than normal, sunny day..17 days…only 2 days of weeping rain. That was super lucky!! I’m from Ireland originally and 17 sunny days – could be a record!! This looks like such a great trip! Glad I stumbled upon your blog! Your photos are great! Looking forward to more! Thank you!! We loved this place – so much history to absorb and such a beautiful setting. It really is a special place – was it a long time since you were there? Only been to Ireland once and couldn’t fit this in to the itinerary but if I ever return I will. 🙂 Looks magnificent, Jill. It’s beautiful, so much history and a special atmosphere – would definitely recommend. It is wonderful your son enjoys these places and is learning history the way it should be taught in the actual locations and seeing it first hand. Love reading your adventures. Thank you so much Terry! We love bringing our son to places like this – hopefully the history will stick – but seeing it first hand is such a wonderful learning experience for me too! That sounds incredible – a mist over the ruins and the lake would definitely be very atmospheric! It really is a special place. Isn’t it amazing how you get big crowds in one place, and just a little way away all is peace and quiet? It seems that if a place is not a UNESCO listing, or on the top ten lists, people just aren’t interested. Absolutely – crowds and crowds of people and so many tour buses all at the ruins, just a few steps away it was like another world – where you could still see the ruins albeit not up close but worth trading that in my opinion for the tranquility and peaceful atmosphere. What a magical extraordinary place, Joy. 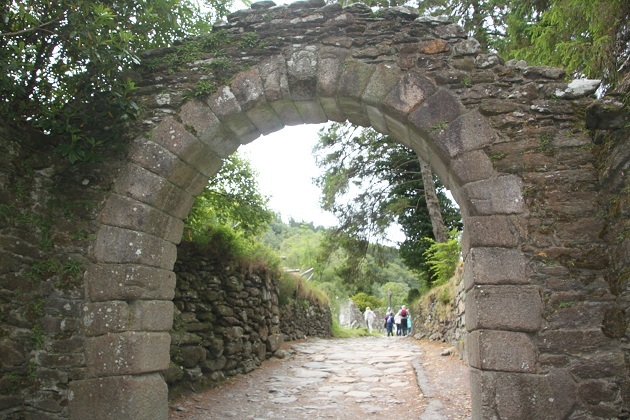 We visited Glendalough during our roadtrip around Ireland in 2008, and it was definitely one of the highlights of the trip. Like you, we could have easily spent hours there, just soaking up the serene beauty. Unfortunately, our flight was leaving from Dublin that evening, so we couldn’t linger. I don’t remember the little house with the stuffed animals though – where was that? We couldn’t linger as long as I would have liked either Reggie as we were planning to visit Powerscourt later and then drive north to see my family. It was a special place though, like you say magical and I would love to go back. The house was in the woods by the upper lake, we just came upon it while strolling. The first image is so green and calming. I also love a good ruin, so intriguing. These ruins were definitely intriguing, trying to decipher the old gravestones was especially fascinating. It is a really green and lush place, I suppose it rains a lot – not on our visit though – the benefit is this lush landscape! It is a lovely place with a wonderful atmosphere – very special! What a fascinating place Joy! I was intrigued as there is a suburb of Perth not too far from us called Glendalough – very different of course but it is in the vicinity of a couple of lakes so presumably somoene who came here from the Wicklow area named it for that reason. No monastic ruins here though! How lovely you had the lake more or less to yourselves even though the monastery and ruins were rather crowded! The scenery looks so peaceful and beautiful. Hope you’ve had a good week and have a lovely weekend! What a coincidence Rosemary and with the lakes as well – there must be some long ago Irish connection! It’s a small world. This is a really special place, we were lucky that part of it was so uncrowded and then just put up with the rest of it. I managed to get some photos with not too many people in there!! Hope your week has gone well too and your weekend is relaxing. Dark, short days here at the moment but actually nice to cozy up indoors and not do much!